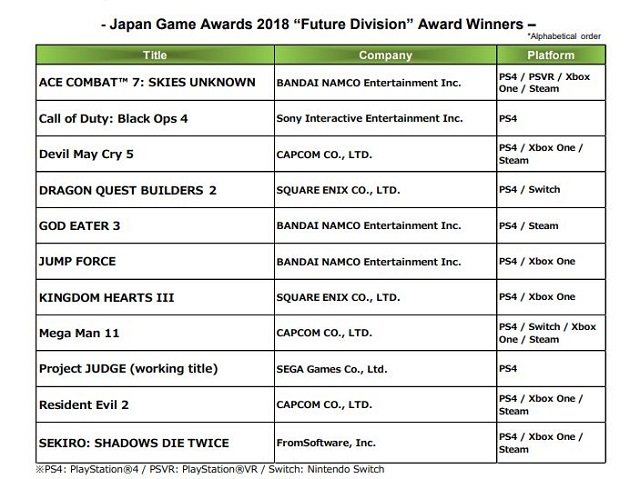 Tokyo Game Show has come and gone, and CESA (Japanese Computer Entertainment Software Association) just declared the winners of the "Future Award". Per tradition, this award goes to upcoming games that received high praise at TGS (collected via attendee votes). Shown above is the official list of Future Award winners (not ranked; everyone is a winner) and look! It's Mega Man 11! 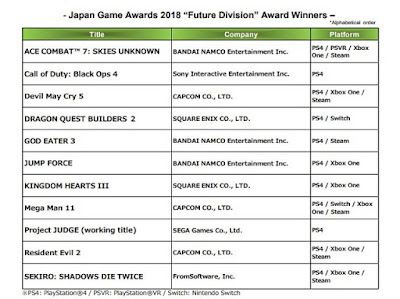 This is the third time a Mega Man game has won a Future Award: Mega Man Battle Network 3 in 2002 followed by Mega Man Battle Network 5 in 2004. Here's a picture of Mega Man 11 producer Kazuhiro Tsuchiya receiving the award. Congrats! Mega Man 11 is due out on Nintendo Switch, PlayStation 4, Xbox One, and PC on October 2nd. My review drops on October 1st.